The contrast between the grey and the flowers are a great combination. Relax in a bouquet of comfort with the Intelligent Design Mina Comforter Set. A beautiful floral arrangement is showcased down the middle of the comforter against a subtle checkered ground. The solid coral reverse provides a gorgeous pop of color, adding extra charm and vibrancy to your bedroom. Also included in this comforter set are two decorative pillows: one is manipulated for a subtle pleated look and the other is intricately embroidered with flowers to bring the whole look together. I purchased this for my teenage daughter. She loves the pattern and all the extra pillows that the set comes with. I'm always hesitant to purchase comforters online because you can't really tell the weight and quality of the comforter but I am pleased with this purchase. My daughter loves her new comforter set. The color is exactly as pictured! There is a touch grey gingham on the sides. Overall, it is a very beautiful comforter set!!! the colors in the picture are a little different. In person the comforter is a deeper pink. other than that this is a great comforter!! 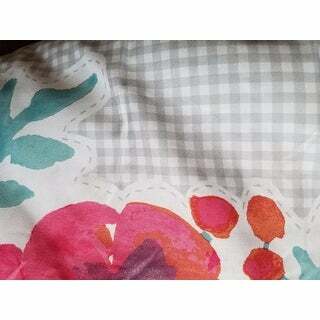 This comforter is wonderfully made and has been great for my daughter's twin bed. I just have to warn that the edge pattern is a hunter green/ mossy gray checked pattern. This was not expected from any of the pictures and we had to change several colors in her room because of it. The flowers are just as bright and colorful as the picture. The sides are quite different and don't really even match. My daughter loves this! It is super bright and she has paired it with many colors throughout the room. I think it can be dressed fancier or taken down to casual like she did. I dont mind the background - i saw other reviewers commented. Yes it is grey and white- you can see it in my pics. It is the same pattern on both sides of the flowers - not sure what other review was talking about. 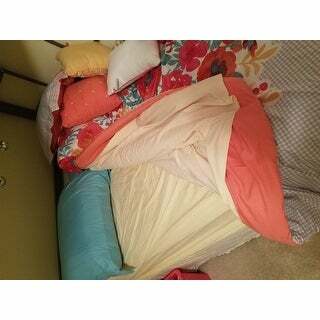 Comes with the 2 pillows that are super cute! (Yellow one is ours) Glad we took the chance! I would definitely recommend this to anyone who loves bright vibrant colors. It's just as beautiful as the pictures. Great set with accent pillows for a great price I love it!!! Such a beautiful and fun set. It really brightens up a room. I also love that it's reversible. Very cute! This product is well worth the money. It makes you bed feel very comfortable. I love this bedroom set. The colors are bright and beautiful. The price was reasonable. I like ordering from overstock they have a lot of great deals. I will definitely order from them again. A little thinner then I wanted. But love the colors. 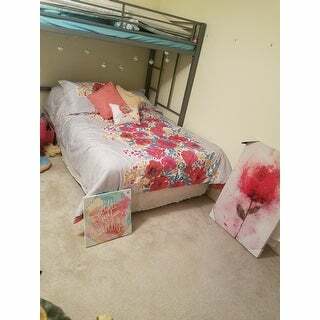 This was a surprise for my granddaughter..We are upgrading her room to a teenager..She loves the colors.. I didnt rate it a 5 star because I thought it would be a little thicker..over all pleased!! The colors are gorgeous and a great price!